In Australia, dragon boat racing is a sport for all races and cultural heritages. According to the Australian Dragon Boat Federation website: “the modern day Dragon Boat has evolved as a sport, capturing the imagination of the world by storm”. With over 50 million paddlers participating annually in competitions worldwide, it is possibly the fastest growing water sport in the world. This is a sport suitable for individuals and corporate teams. It is an excellent sport for people of all ages who are reasonably fit and who enjoy being a team player and being on the water. It is a dynamic and exciting sport for individuals or corporates at state, national, or international levels. Most clubs cater for competitive and non-competitive members and all enjoy the fun and social interaction of the sport as well. In many ways, dragon boat racing has become a sport in its own right; it is practised throughout the year, not necessarily connected to the dragon boat festival itself. Chung Wah staged the first Chung Wah Cup Dragon Boat competition on 12th June 2016. 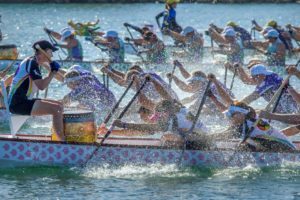 The event, which was attended by about eight hundred people, celebrated the traditional Chinese practice of dragon boat racing in the beautiful and scenic Champion Lakes Regatta Centre in Armadale. We invite you to join our Dragon Boat Team to train and race for fitness, teamwork, and fun.